Little baby Selva is 100% deaf and cannot hear at all. She is a bright kid and is learning sign language at an early age of 2 years. 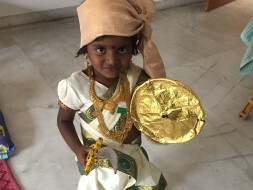 Given the right support of a good hearing aid, she would be able to attend speech therapy classes as she is not used to talking due to her not being able to hear a single sound. Any help would be appreciated.